Today's tournament featured three quads. NM Oliver Chernin was the favorite in quad one, but was held to a draw in the final round by expert Eric Zhang. 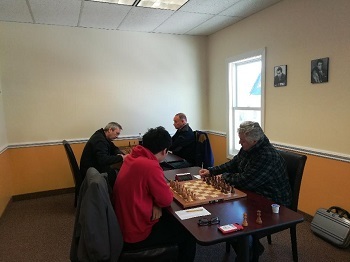 The two players shared first palce, while Zhang inches closer and closer to getting the master title! In quad two it was Julian Wang who emerged victorious with a perfect 3/3 score. Wang continues his recent comeback and has already gained over 125 points just in the last month! Finally, the third quad saw another tie for first place. This time it was Tyler Tanaka-Wong and Varsity Dream Teamer Sahil Vora who shared first place with 2/3 each. Thank you to everyone that came out this weekend!